Cardiff Blues back Tom Williams has joined Scarlets on a season-long loan. 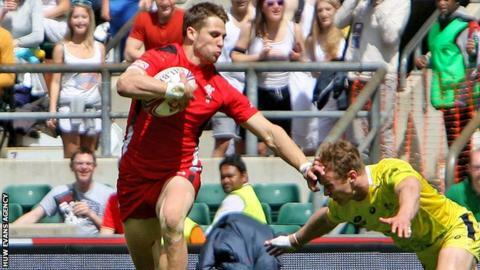 The Wales Sevens player, 24, is the brother of Wales scrum-half Lloyd and son of British and Irish Lions and Wales great number nine Brynmor. "It's a great opportunity for me to come the Scarlets and I'm hoping to get some game time under my belt," he said. "There's a lot of competition for places here and quality players like Steff Evans, Michael Tagicakibau and Liam Williams." Tom Williams has made 22 appearances for Cardiff Blues, scoring two tries, since making his debut in September 2012 against Newport Gwent Dragons. Scarlets head coach Wayne Pivac said: "Due to Rugby World Cup selection coupled with long-term and short-term injuries to Harry Robinson, Steff Hughes and Jordan Williams we have bolstered the outside backs with Tom Williams, who gives us both full-back and wing cover. "Tom is an exciting young player who's been a regular on the Sevens circuit and he joins us on a season-long loan. We look forward to seeing his continued development with us here at the Scarlets."